The kitchen is one of the most important parts of the house. So if your kitchen is out of date and looks bad, the best solution is to improve and enhance the look of your kitchen faucets at home. All you need is a type of kitchen touch faucet. Faucets that turn on with a tap of the finger, forearm or hand are great for messy hands or full arms. It’s amazing how technology has changed the plumbing world. One item that is continuing to gain popularity, particularly in kitchens, is the touch faucet. These faucets or fittings have sensors located along the spout and handle of the faucet. With a quick tap from a finger, forearm or hand, the flow of water is activated. 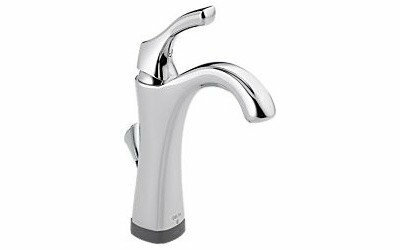 Although these faucets can also operate in manual modes, the touch mode is great for messy hands or full arms. Cost: Most touch faucets start at around $350, with prices reaching $600 or more. The price can depend on where you shop, and a faucet always comes with a complete installation kit (including battery pack). Today, it’s easy to find touch faucets at major retailers — both online and in stores. If you hunt, you can find these kitchen fixtures for as low as $280 online. 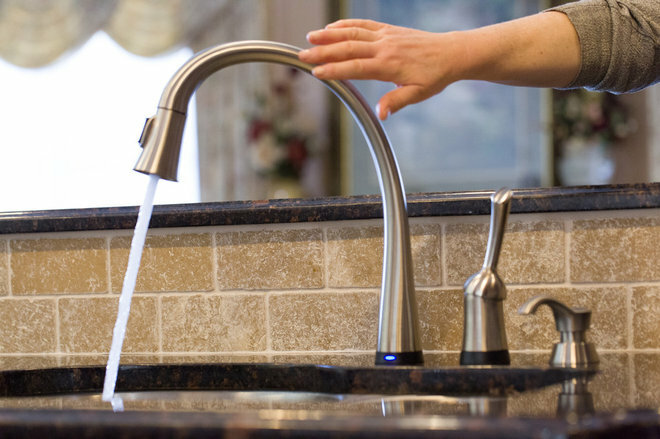 Delta’s Touch2O is available for kitchen and bathroom faucets. The faucet features a proximity sensor to automatically come on when you get close. The flow can also be activated by touch or manually using the handle. This no-brainer faucet makes it simple for your little ones to remember to conserve water while brushing their teeth.